Modern Door Hardware from Emtek, Linnea and More. With one of the largest selections of modern door hardware on the web, we're sure to have the perfect hardware for your home or office project. Modern door hardware is becoming more and more popular these days, so we've done our best to expand this growing category with great products at all price levels. Whether you're looking for affordable levers, or high end stainless steel hardware we can help you out. If you are unable to find the right modern hardware for your project, please contact us. We're looking for new modern products all the time. We may have what you need. 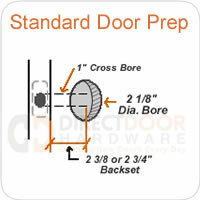 One of the main questions we have from customers seeking modern door hardware is what to do on exterior doors. Because of their sleek design, modern door levers generally are not available in a keyed version. The best option for exterior doors would be to use a passage lever with a modern deadbolt to match above. 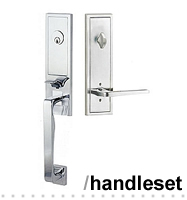 This will give you the clean look of a modern lever or knob, with the locking capability of the deadbolt. Deadbolt locks are more secure than a keyed knob or lever anyway, so this is a great solution. Another option would be to use an entrance handleset on your exterior door, but of course these are a bit too fancy for every exterior door. Modern Design is all about simplicity and clean lines. 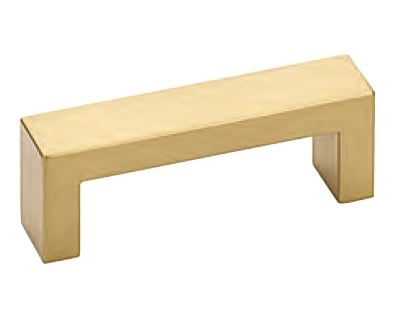 This simplicity should be consistent throughout the space from door levers or knobs to door stops and flush pulls. The most popular finish for modern hardware is stainless steel. We have all kinds of products available in stainless steel, but there are also many available in popular oil rubbed bronze and satin nickel finishes. The oil rubbed bronze finish is an excellent choice for a more rustic style home with a modern flair. For Oil rubbed finishes, be sure to check out the Emtek brand of modern hardware.